Much has been made of Roberto Luongo’s plight here in Vancouver in recent years. Starting with the Stanley Cup Finals in June 2011, it’s been two and a half years of turmoil, tension, and drama. The Luongo saga took yet another fascinating turn this past weekend when Eddie Lack was named the starter for Sunday’s Heritage Classic game at BC Place versus the Ottawa Senators. Lack played the first game coming out of the Olympic break, shutting out the St. Louis Blues 1-0 on Wednesday night. Made sense given that Luongo returned to Vancouver from Sochi just a couple of days prior. Lack was also given the next start, a tight 2-1 shoot-out loss to the Minnesota Wild. Although Lack played very well, the loss – albeit a close one – opened the door for a Luongo start on Sunday. As word broke on Saturday that Luongo would not be starting, Twitter erupted with people arguing both sides. Many people cited Lack’s strong play of late as giving the Canucks the best chance to win. And I get that we’re in a dog fight to make the playoffs. I said it before the game and I’ve said it since: the Canucks needed to look at the “bigger picture” here. The bigger picture to me says that Luongo was not treated fairly last year (losing his job to Schneider before watching Schneider – and not him – get traded) and was deserving of the Heritage Classic start. 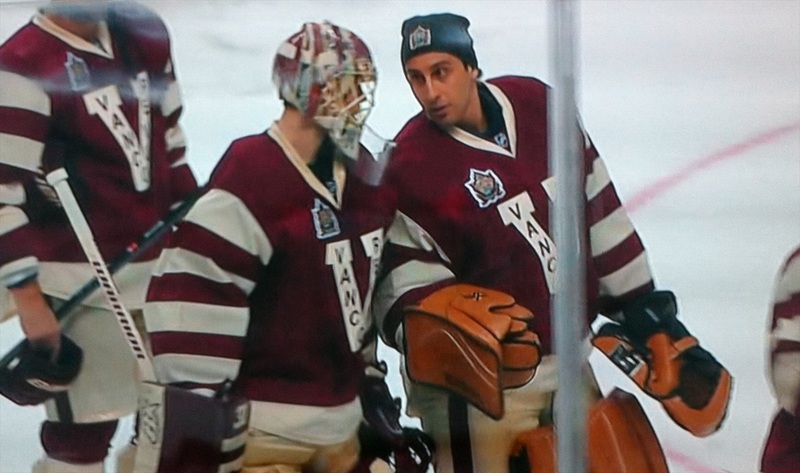 This doesn’t have anything to do with emotions; Luongo’s last start was a solid shutout victory in the Olympics. And just as there was no drop-off going from Luongo to Lack, there certainly was no drop-off going from Lack to Luongo. Luongo needed to start. Truthfully, I would be saying the same thing if the Canucks had won the game, or even if Lack had pitched another shutout. So there I was on Sunday afternoon with my son Sean, soaking in the sights and sounds of the world’s largest indoor hockey game. I was able to snap some pretty good pictures (see them all here) including one of poor Roberto Luongo sitting on his own at the end of the bench. After Ottawa took a 3-2 lead in the second period, an audible “We Want Lu!” chant broke out in the stadium. It was quite a surreal moment, magnified by the fact that there were 35,000 more fans than usual watching the game live and millions watching on TV across the country. It was a tense and awkward few seconds. It reminded me of the feeling that I got watching the first game of the lockout-shortened 2013 season. 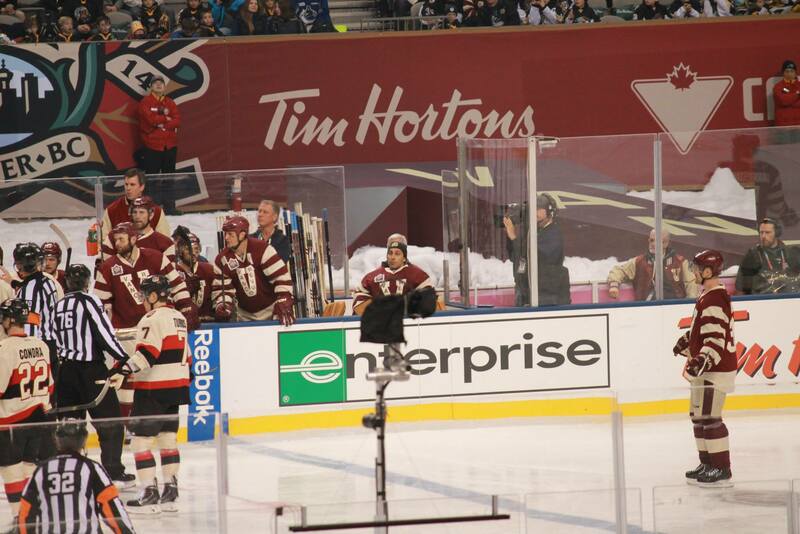 In the home opener on January 19, 2013, Cory Schneider got the start as the newly-anointed starting Canucks goalie. The Canucks lost that game 7-3 to the visiting Anaheim Ducks, and Schneider was pulled early in the second period after allowing 5 goals on only 14 shots, including goals on 3 straight shots. I vividly remember the mood in the crowd that evening: the fans were desperate for hockey and excited to see the Canucks back in action. But as each shot got past Schneider, the mood in the building became more and more tense, culminating in a tense buzz as Luongo skated out to replace Schneider (start at the 2:23 mark in the video below). Next story Thank you, Lu!